Highway, narrow sealed roads, unsealed roads and 4WD trails. 4WD essential for complete trail. A scenic bushland circuit through quieter parts of Blue Mountains National Park and Wollemi National Park. A fine cycling tour. Several lookouts and walking tracks and two national park camping/picnic areas. Fruit stalls and galleries on Bells Line of Road and in Kurrajong Heights. Includes 4WD trails. Dry weather only. Kurrajong village is just off Bells Line of Road (and the main Greater Blue Mountains Drive and The Botanists Way) but well worth the diversion for its cafes and galleries. Travel west along Bells Line of Road and up Bellbird Hill. Don't miss the view over the Hawkesbury from Bellbird Lookout. Turn left at Kurrajong Heights into Warks Road, follow it to Burralow Road and turn left again. The road goes along the ridge-top until a large communications tower is passed on the right. Now a 4WD trail enters Blue Mountains National Park and descends into the Burralow Valley through superb forest. At the intersection in the valley, turn right to reach the camping/picnic area on a large alluvial flat - the site of an early experiment in irrigated rice-growing in Australia. An easy walking track to a ferny grotto begins from here. Back on the main trail, cross Burralow Creek and climb out of the valley onto Paterson Range which is followed along the edge of the Grose Wilderness back to Bells Line of Road. Turn left towards Bilpin then right onto the sealed Mountain Lagoon Road. Mountain Lagoon is a natural small lake, an unusual feature caused by geological tilting of the plateau (similar to the origin of Thirlmere Lakes). The isolated settlement here is based on rich soils. An excellent diversion here is to take Sams Way around the lagoon, turn onto the T3 Trail and follow it to the impressive views from T3 Lookout over the Colo River gorge and Wollemi Wilderness. Back at Mountain Lagoon, a 4WD trail continues 11.5km east down a long incline to join Comleroy Road. 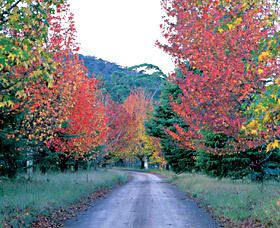 Turn right and descend to Wheeny Creek picnic/camping area with its superb Sydney blue gums and grass flats. Comleroy Road climbs up the other side of the Wheeny Creek valley then south back to Bells Line of Road near Kurrajong.